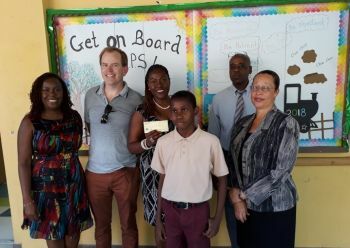 The three schools were among 10 that participated in a Territory-wide essay writing competition that saw over 30 students 12 years or younger, submitting a one page persuasive letter on how the BVIBA could help their school. The $10,000 first prize was won by the Alexandrina Maduro Primary School with the author of its winning entry being 12 year old, Dareon Mercer. Dareon transferred to the school shortly after the September 2017 hurricanes and in his letter expressed concern for a group of students who participated in the Therapeutic Kindergarten Programme. The $7,000 second prize was won by First Impressions Primary School. The co-authors of the school's winning entry were Orrett Kennedy aged 10, Kady Carrington aged 10 and Kaden Lewis, aged 11. That submission explained just how severely the hurricanes impacted the school and referred to the loss of the school's physical education teacher, Mr Xavier ‘Dag’ Samuels, who tragically died during the passage of hurricane Irma. The $3,000 third prize was won by St George's Primary School whose 11 year old Destinee Cline, in her letter, painted a clear and descriptive picture of school life since the hurricanes with the school facing problems with rodents, birds and roaches and having no back windows. According to Ms Daley, “If we can help in this small way to get our schools fully up and running again, then this is money well spent”. Congrats Dareon! And congratulations to all the other participants!